Article Poster | Best Amazon Affiliate Themes And Plugins Ever Seen! Article Poster is a new WordPress plugin that posts hundreds articles to your sites and associated social network accounts. Our plugin automatically collects articles according to your keywords, rewrites them through selected Rewrite Service and publishes them to your sites. 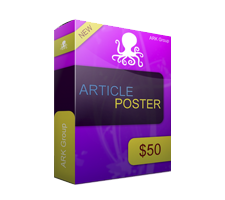 With Article Poster you can create a cool blog for any affiliate site! There are no difference if it is an amazon affiliate store, clickbank, linkshare, or any other. Also you can use it for any adsense site – just create dozen categories, fill them with thousands articles and promote through hundreds social network accounts! All demo articles are already rewritten by Spin Rewritter. Four different article sources: Article Builder, ezinearticles.com, goarticles.com and ezinemark.com. Four different rewrite services supported: Spin Rewriter, The Best Spinner, SpinnerChief and SpinChimp. Social Integration – all articles can be automatically published to Facebook, Twitter, Google+(Google Plus), Blogger, Tumblr, LiveJournal, FriendFeed, DreamWidth, Delicious, Diigo, Instapaper, Stumbleupon, LinkedIn, Pinterest, Plurk, VKontakte(VK.com), YouTube, WordPress, etc. Proxies – anyone who already has an experience with different auto posting tools knows that it’s impossible to fetch articles from different sites without proxies. So, usually, if you plan to use some auto posting software you have to buy some private proxies that will cost you up to $20-$40/month. With our Article Poster you don’t need to buy proxies because our plugin works with our own ARK Group proxies and they are already included in the plugin. With Article Poster you will save up to $300-$400/year. Easy To Use – all you have to do is to enter the keywords, select the source for your articles (Article Builder, ezinearticles.com, goarticles.com or ezinemark.com), select the category on your site where new articles will be published and enter the rewriter information. Then Article Poster will be automatically launched every few hours and publish new articles on your sites and into your social network accounts.